Myrtle Beach averages 215 sunny days per year! So, chances are during your stay you will be able to enjoy some fabulous weather. Often when it does rain here, we are lucky because it’s not usually a washout and the rain passes quickly, allowing for vacationers to get back out on the beach as soon as possible. However, if it does happen to be a rare rainy day during your vacation at Carolina Dunes, don’t fret, there are plenty of indoor activities that you can enjoy while staying dry and still having fun. If you book direct through CarolinaDunesMyrtleBeach.com, then you are in luck because we have a partnership with The Caravelle Resort, located just steps from our oceanfront condo building. You can enjoy such amenities as the large indoor pool and whirlpool, the indoor fitness facility to work off some vacation calories, arcade room where kids can enjoy some fun competition and Liquids Lounge where you can enjoy some tasty food and drinks. 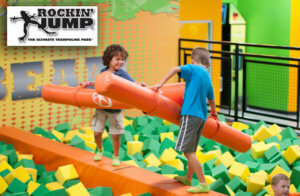 If you have kids in your family who have some energy that needs releasing on a rainy day, head over to Rockin’ Jump, located about 4 miles from Carolina Dunes. Kids (and adults!) can jump for various increments: 30 minutes, 60 minutes, 90 minutes or 120 minutes. Attractions include the Ninja Challenge Course, Stunt Bag, X-Beam, Dodgeball Arena and more. They also have various events throughout the year on select dates such as Rockin’ Tots, Rockin’ Saturdays for all ages and Rockin’ Fridays featuring a live DJ for ages 11-17. A great option for a rainy day is to cuddle up with a book on the couch of your oceanfront condo. From there you will be able to see off the balcony and watch the ocean as you enjoy a good read and a cup of coffee. Or, if you brought board games along you can spread out in the living room for some traditional family fan and enjoy a little bit of competiveness. Broadway at the Beach is located only about 4.5 miles from Carolina Dunes and offers plenty of indoor options for your rainy day activities. Check out the colorful fish and sea creatures at Ripley’s Aquarium, lay on a bed of nails at WonderWorks or come face to face with celebrities at the Hollywood Wax Museum. You can also catch a movie at the Big D Theater, get lost at the Backstage Mirror Maze, see a show at Legends In Concert or Palace Theatre, find your way out of Backstage Escape Games, dress up in old costumes at Old Tyme Portraits or browse the various shops at the complex. There’s so much to do at Broadway at the Beach on a rainy day. Just be sure to bring an umbrella if you plan to hop around from attraction to attraction or if you want to browse the various shops. As you can see there are many indoor rainy day options in Myrtle Beach. So, while you will likely have beautiful weather for your vacation, there are many back-up options if a rare rain shower occurs during your stay at Carolina Dunes in Myrtle Beach! Are you ready to book your stay? Check out our current deals and resort specials here.